According to the Federal Bureau of Investigations (FBI), hate crimes add an element of bias to traditional crimes. The violence involved in the crime targets someone specifically for their gender, race, ethnicity, religion, sexual orientation, disability, etc. The victims of hate crimes and domestic terrorism may be individuals, businesses, institutions, etc. Hate crimes cover a wide variety of news headlines in recent years, ranging from those being targeted for being gay, to crimes being committed against someone because of their race. 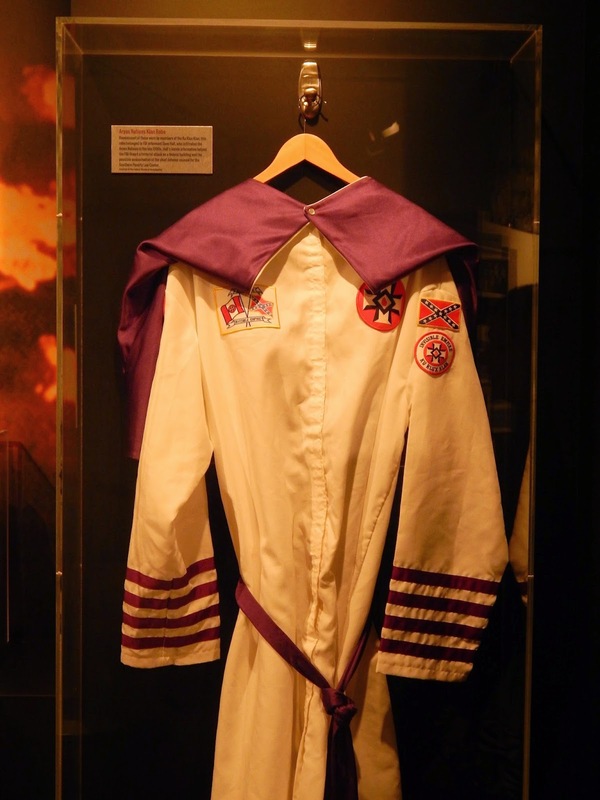 Artifacts in the new “Attack on America: The Fight Against Terrorism & Hate Crimes” exhibit at the Crime Museum include a runner’s medal and bib from the Boston Marathon Bombing, a Ku Klux Klan ceremonial robe, a noose from a lynching, and the gun used in the 2012 attack aimed at the politically conservative Family Resource Council in Washington, DC. * A rifle confiscated from the Virginia Jihad Network in 2003, after its failed attempt to train assassins at the Paintball War Games facility in Spotsylvania, VA.
* Letters from the Unabomber, Ted Kaczynski, who was a serial murderer. * World Trade Center rubble and other 9/11 artifacts. The bust recreation of prisoner Vinson Harris, who was suffocated and killed by prison security guards in 1986, while serving a 20-year sentence for bank robbery. The bust was used at the trial to visually illustrate to the court how Harris had been suffocated with elastic bandages and duct tape. The Crime Museum also offers a variety of other temporary and traveling exhibits, summer camp programs, walking tours, educational hands-on exhibits, and more. For more information to purchase tickets, visit their site at at www.crimemuseum.org. About the Crime Museum: Crime Museum is located in Washington D.C. The mission is to provide guests of all ages with memorable insight into the issues of crime, crime fighting, and the consequences of committing a crime in America, through an interactive, entertaining, and educational experience. The museum offers walking tours, summer camps, galleries, a crime library, temporary and traveling exhibits, and more.